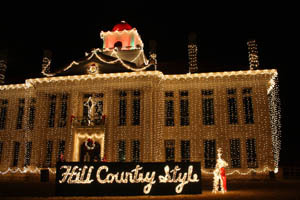 Christmas is glowing in Johnson City, Texas, as Lights Spectacular displays shine throughout the town, with the Blanco County Courthouse as centerpiece of the fabulous show. More than 100,000 twinkling lights are shining during the 21st year of this stunning display. 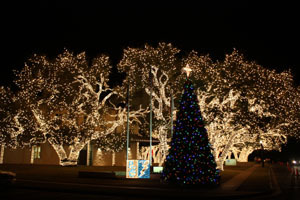 Additionally, the Pedernales Electric Co-op’s Headquarters boasts a lighted forest of over one million lights. Together with lighting on local homes, businesses and churches, the Christmas presentation makes a glowing gift from the city to the public. It’s an extraordinary exhibit worth the hour’s drive from Austin. Lights shine each night until midnight through January 1, 2011. The Courthouse, where visitors can enjoy a decorated tree and sales of ornaments and crafts from the Garden Club, is open from 6-9 p.m. Saturday and Sunday nights,. Carriage rides are available, and some local businesses have extended hours for holiday shopping or browsing through galleries. Johnson City (named for the family of former president Lyndon B. Johnson) is located in central Texas, 48 miles west of Austin and 60 miles north of San Antonio. 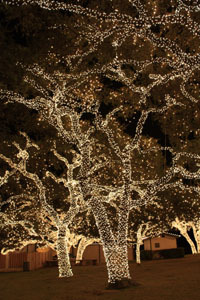 It is one of the best stops on the Texas Hill Country Regional Christmas Lighting Trail—an unforgettable site even if you can’t travel the entire trail.